You wouldn’t think so, but a majority of all purchase decisions are largely dependent on the way a store’s merchandise is displayed. A retail display can successfully convert a window shopper into a customer. As such, they’re considered to be a crucial part of small business marketing campaigns for festive events, such as Valentine’s Day, to boost sales. However, if you think that you can add some balloons in your retail window and call it a day, think again, because retail display is not quite as easy as you may think it is. In fact, an entire career path is dedicated to just creating appealing retail displays. People are actually paid big bucks for designing a store and its windows in a way that it highlights the merchandise to influence, attract, and entice the buyers into spending their money. It’s called Visual Merchandising, in case you’re wondering. A lot of hard work and thought goes into designing an appropriate retail window display simply because it is a reflection of your brand’s image. Your merchandise and how it’s showcased needs to represent what your brand is all about. Are you now sufficiently worried about the Valentine’s Day retail display for your own store? Don’t be – we’ve got the perfect retail display ideas for you to try. Fairy lights, lanterns, and candles are all absolutely wonderful for influencing a store’s ambiance. For Valentine’s Day, one of the nicest – and easiest – ways to create window displays is to strategically place candles, hang lanterns, or just create window decals from string or fairy lights. 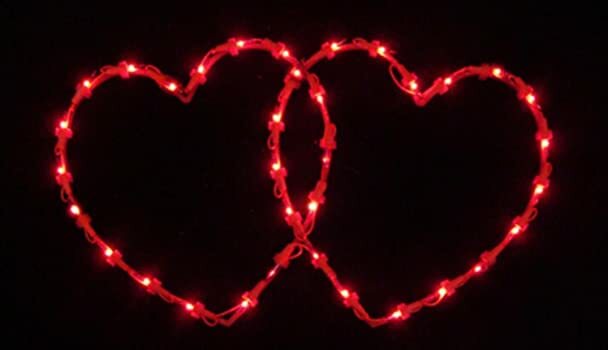 You don’t have to limit the lights to the window display either – spread out the festive candles or lights (heart-shaped ones preferably) throughout the store for an environment of love. If you can safely, while you switch the lights on in the evening, you can also light up the candles for that added glow. Much like with Christmas decorations, oftentimes store owners go completely overboard with Valentine’s Day décor. As soon as January ends, every which where you look, you’re bombarded with a whole lot of red. Sometimes, especially with window displays at retail stores, less is more. Take the above image for example. Miu Miu’s storefront for Valentine’s Day back in 2011 was this minimalistic look of two hearts encasing their product display. It’s classy, chic, and gets the message across. This Tiffany and Co. display is just as pretty and appealing with the perfect use of strategic lighting and careful display of Valentine’s Day festivity. Valentine’s Day is the perfect opportunity to get a little cheeky with the comments and innuendos. You can also ‘tastefully’ incorporate that into your marketing campaign and include quirky one-liners as part of your window display to attract customers. Take this window display for example. Sure, it’s suggestive, but it’s funny too, and good humor is always attractive. 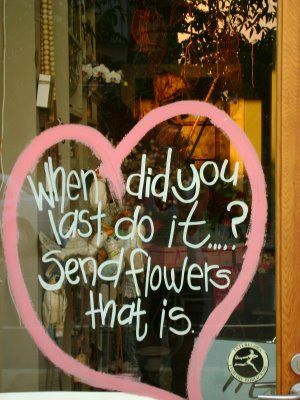 Another clever example is this picture taken from Pinterest of a flower shop that has this funny little decal printed on their store’s front window. We’re sure this would’ve attracted a lot of customers to the store because along with being hilarious, it’s also serving as a reminder to the last minute Valentine’s Day shoppers that there might be things they’re possibly forgetting – like sending flowers to their loved ones, maybe? Great tactic for driving business, that one! Though a lot of merchants think so, retail designs aren’t limited to display windows. The inside of the store itself is just as important as the outside. Valentine’s Day is the perfect opportunity to spruce up the interior of your store and change things around. A great way to do just that is to have your staff create creative signage and place them strategically all over the place. Cupid plays a very important role in the whole Valentine’s Day occasion. Use the angel of love as an inspiration for your window or retail displays as creatively as you possibly can and we guarantee you’ll have on your hands a winner. Take this amazing heart-shaped bull’s eye with the love arrows landing straight on. It’s creative, funny, and gets the Valentine’s Day message across loud and clear – what more could you possibly want? 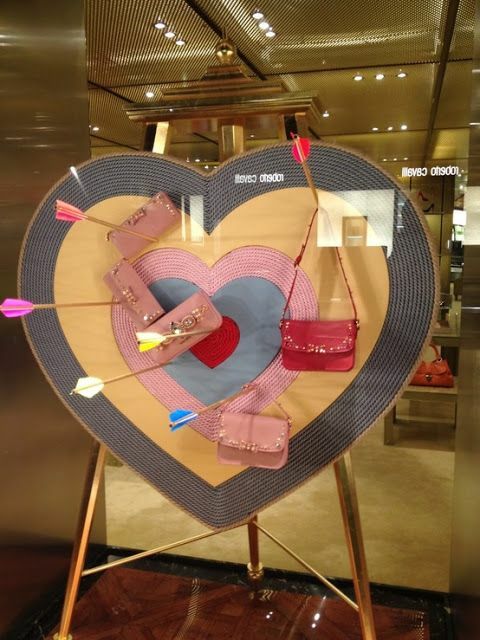 You can also use Cupid as an inspiration to highlight your products, just like Tiffany and Co. did in this Valentine’s Day display. 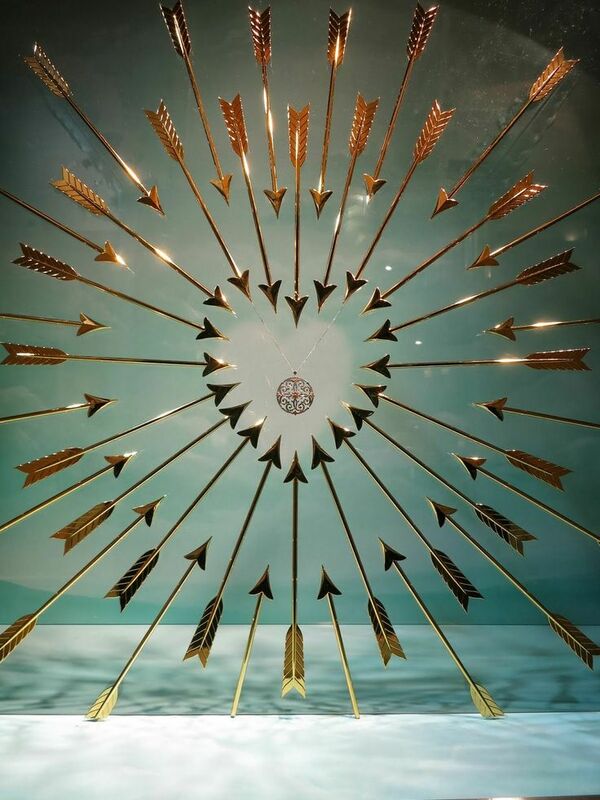 A breathtakingly beautiful necklace is surrounded by these elegant (yes, we just used this word to describe arrows) arrows forming a heart. Now, this is what we call retail displays done right!